to entice people to use the Zero Carbon Project, provide a blockchain-driven incentive scheme to reward consumers for engaging with the Zero Carbon Project and encourage consumer action. The first part of our solution consists of a competitive ‘Zero Carbon Market’ which provides consumers access to cheaper energy contracts where the carbon emissions have been offset by international carbon credits. Secondly, our blockchain economy is based on ZeroCarbon tokens that have been designed to capture the future value that customers receive form our Market. This is enabled using the distributed ledger, Ethereum smart contracts and crypto exchanges. ZeroCarbon tokens are underpinned by concrete value as energy suppliers must use them to pay their transaction fees for using our Market. Therefore, as our consumer base grows, the demand for ZeroCarbon tokens increases, constrained by a fixed supply. 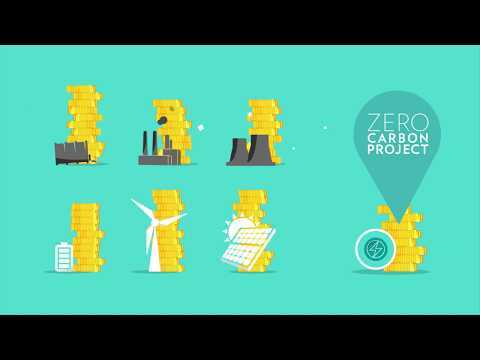 We intend that up to 70% of the transaction fees received by the Zero Carbon Project will be ‘recycled’ and provided to consumers as rewards for engaging with the Zero Carbon Project. Energy suppliers and consumers (“Customers”) can sell ZeroCarbon tokens to other customers, including energy suppliers who purchase them to pay transaction fees. This is the ZeroCarbon economic cycle. We have been actively building the Zero Carbon Market over the last year. This includes building the Project team, completing the systems, designing the ZeroCarbon smart contracts and registering energy suppliers in the UK. Our UK Market is now complete and ready for launch in October 2018. This will be followed by a global rollout in 2019. The Zero Carbon Project is a subsidiary of Beond www.beondgroup.com which is an award-winning energy and carbon consultancy based in London. Beond is a team of 30 energy market professionals who are passionate about helping clients achieve their ambitions and also about tackling global climate change, through the application of new technologies. Our core values are integrity, innovation and quality. Beond services over 600 energy consumers in UK including Knight Frank, Capita, The Salvation Army and Salford County Council, and has received eight awards over the last three years covering innovation, green business and consultancy services. Small team and I cannot see domain expertise from the history of LinkedIn working! Whitepaper is solid - idea of zero carbon project explained well; and very unique use-case of Blockchain so far! They need solid team to execute it between different countries government regulations. Moderately good social media presence and good medium articles. Loved the MVP the way it calculates various options based on energy usages and energy suppliers but would like to see how Blockchain is involved. The concept is interesting to me as I have thought renewable energy is among the best in tackling climate change but it seems I was wrong when I heard about zero carbon projects which are new to me. Team is a bit thin in terms of running this ICO and helping for fund raising but you have two agencies associated which are good for this project at the moment. I am eager to see the MVP which is not available so 4* is the max for now. Good luck to the team! Let's make our planet cleaner with the project. Really good team. Idea is really good and very relative to current world problems. MVP is good. Project has good vibe and following in the crypto world. Whitepaper is detailed and informative. Best of luck team. Small Team....Will suggest to add some experienced advisor. Great Vision.. KYC Done. I like the vision on this project. I will keep an eye on this one! Best of luck team. Team - well experienced and educated core team. May need advice on ICO strategy for fund raising and marketing , but the project should hopefully sell itself. Vision - on the face of it, a noble cause of offsetting carbon emissions with money raised from offset contracts helping subsidise zero carbon energy projects. Use of DLT should make the market more efficient. But, as explained in the WP, this is a short to mid term solution whilst we wait for economies of scale in renewable, zero carbon energy production to be realised. It could be seen that this project slows down the move to renewables, but at the same time, it does more than fossil fuels alone. Tokenomics make sense once the project ramps up and the tokens are used in multiple jurisdictions. More details of use of funds for soft and mid cap should be considered. Product - no MVP on website. 3 for the moment. Due to this being a short to mid term solution, you need to consider the tokens' long term utility if you are looking to invest here. Good luck to the team in implementing this project and hopefully bringing carbon efficiency to the masses. Really well written whitepaper and interesting blockchain use case. I tend to be attracted to projects like this more than other ICO's, primarily because it creates solutions to problems that need addressing urgently. The team seem to highly experienced in their respective fields, would still probably help to expand the team a little. Even more so with regards to getting a few more experienced advisors on board.